Vadasi has, in recent weeks, fast become my go-to Hero and is on the verge of replacing Griselma as my favourite in Gigantic. Part of the reason why I love her so much isn't just because of her valuable healing, but the complexity her play and the fact that when she's played well, she makes an enormous difference to any team. Surprisingly, Vadasi is more than capable of dealing high damage and thanks to her healing, can survive for lengthy periods of time. Better still, when she upgrades her skill has has lots of mobility and an invaluable super jump. I will stress that Vadasi is partcularly challenging to play well but she's also incredibly rewarding. Careful use of your Devotion can make or break Vadasi. Guide Updated: 14 September 2015. This section of our guide contains a list of Vadasi skills, what they do, which upgrades you should choose (and when) as well as what those upgrades are for. Ray of Judgement has two functions: healing allies and damaging enemies. Holding the left mouse button down and targetting an ally will provide a gradual heal of 50 health per second. It isn't a huge amount but can be significantly improved by using Devotion at the same time. 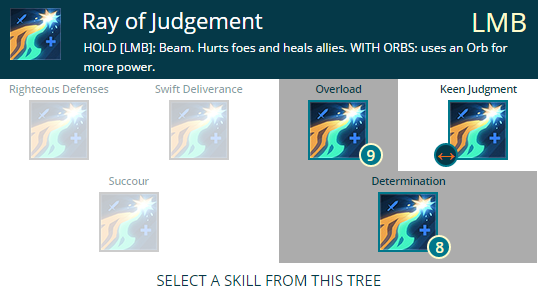 If you channel two Devotion Orbs and use Ray of Judgement on an ally, you'll provide a big spike heal but consume the Orbs (remember this for later). If you target an enemy with Ray of Judgement, you'll send a power beam to them that causes a steady stream of damage. It's pretty significant and most enemies will try to escape your beam as quickly as possible. Similarly to healing, you can stack Devotion Orbs to deal more damage when channeling. Smite is your ranged projectile that has no cooldown and which you can effectively spam. Its default damage isn't high, but the fact you can use it so rapidly makes up for this. 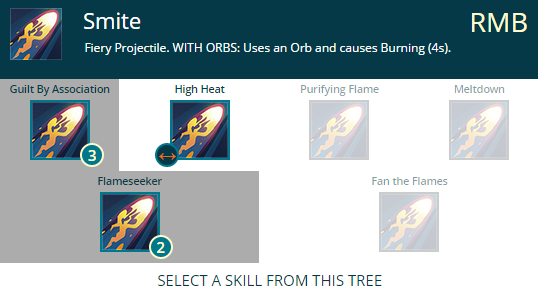 If you've an Orb active, using Smite will cause burning on a struck target but also consume the Orb (you effectively get two hits or Burning without talents). If you aren't in melee range of an enemy, you should be poking with Smite constantly. Divine Wind allows Vadasi to regenerate her health over a period of time. The regen comes in blocks, rather than a trickle, meaning you receive a bank of healing. With Orbs, your healing amount is significantly increased. 1. You shouldn't be constantly running around with Devotion on at all times. 2. Devotion drains your health by a large amount when you create Orbs. 3. Even with Orbs, you cannot kill yourself but you can reach 1 health. 4. Orbs directly improve your damage and healing across all your skills. 5. You need to hold E to gain both Orbs - always get both. Now that we've got that out the way, I really can't emphasise enough just how important Devotion is. It's your spike heal (Devotion + Divine Wind for yourself or Devoition + Ray of Judgement on an ally) but also a means of significantly increasing your damage with Ray of Judgement or Smite (Orbs cause burning). If you neglet your Orb use, or use them at inopportune moments, you'll leave yourself vulnerable and fail to help your team. Armor of Faith allows Vadasi to become totally immune to all damage for 4 seconds. It's incredible for escaping but also going toe to toe with enemy players who think they've an easy kill. Just be sure not to waste it. Below is the upgrade path I would recommend for each skill. It offers Vadasi high survivability and good damage output. There are one or two variables (which I'll discuss below) but for the most part, they allow Vadasi to fill a hybrid role that's still incredibly good at healing and dealing damage. Variable: High heat is a good alternative if you find that your enemy isn't grouping up early game as it'll allow Smite to deal more single target damage. Determination allows Vadasi to get +25 armor when using Orbs and hitting an enemy. It's a good boost to your survivability and allows you to facetank a little more when a melee Hero is in your face. Overload allows you to deal extra damage against burning foes. This pairs great with Smite and Devotion. Flameseeker allows you to fire Smite further and faster. The speed difference is pretty huge and allows you to really reign down attacks from afar. Guilt By Association builds on this and allows Smite to cause burning to allows next to the target you hit. Against the likes of Voden or Griselma, this is incredible for quickly clearing them. It's also brilliant when groups of enemy Hero's are gathered together in a corridor. Uplifting Chorus provides Vadasi with a significant increase to her speed and jump height on use. It does however increase the cooldown. Gust causes Divine Wind to knock enemies back when the Orbs are consumed, granting you valuable time to escape from melee players (especially with the increased speed!). 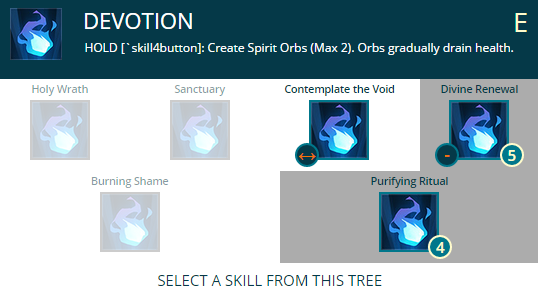 Purifying Ritual isn't an offensive option, but the path does allow you to gain Orbs more often and for that reason, it supports Smite much more and allows you to lose all debuffs (invaluable at keeping you alive). Combined with Divine Renewal, you can use Devotion more often and thus cause more burning with Smite or heal yourself more frequently. Renewal of Faith and as the last upgrade, allows Vadasi to reset all her cooldowns on use. This pretty much allows you to gaurentee your escape if you use Devotion > Divine Wind > Jump away. The best of the two, Transcendence allows you to have 3 orbs instead of 2. This boosts your healing and damage potential significantly and allows you to use Smite 3 times to cause burning. This talent is pretty standard for most Hero's and allows Vadasi to grant a 10% damage buff to her allies when she debuffs an enemy. Hard Charger provides 33% extra stamina for Vadasi. This is huge when casting skills, sprinting or generally being in combat. Better yet, it also prevents you being knocked back too far by enemy skills. It'll save your life multiple times. Building on Hard Charger, Hero's Vitality provides you with 15% extra health. It's a brilliant talent for allowing you to take much more punishment. This section of our guide contains a list of tactics for skirmining, team fighting and dueling against Hero's with Vadasi. I will point out that as a healer, your primarily role should be providing group wide support (that's healing and dealing damage) and I'd recommend you're always with your team, rather than going solo. In the grand scheme of things, no Hero against Vadasi is a huge threat as you can easily escape. As such, this list is primarily based on you sticking around and fighting it out. Aisling can be a challenge due to Cador body blocking your attacks. If you try to LMB Aisling, the attacks will hit Cador. 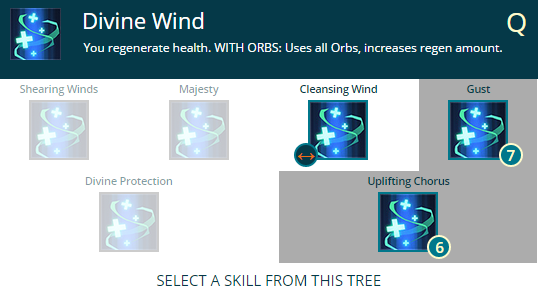 The best thing to do is boot up your orbs, use Smite until you're mid health and then consume them with Divine Wind. Keep Aisling at range and use Smite again. If she gets close, use RMB when you've got a clear shot. The main thing you have to do - at all costs - is avoid Cador's stun/immobilize. If you're caught in that, you'll take a fair chunk of damage. Charnok isn't too difficult for Vadasi because you can confortable poke him from range and he if does the same, you can heal where as he can't. If it's a mid-range fight, things change a lot but you're still in control thanks to your healing and LMB damage. Just be sure to avoid Hot Hail. If he uses Dragon'st Breath, don't be too worried. It deals high damage but you can comfortably strafe around it or quickly use Orbs > Divine Wind. The most important thing with Charnok is to not use your heal early and to keep burning him as much as possible without leaving yourself too low on health. If Griselma has all 3 of her Portal Beasts the best thing to do is stay as far back as possible and use Smite's AOE burn. If Griselma has taken Empowering Touch, you'll never burst them down whilst she heals them. The best thing to do is wait for reinfocements. If Griselma is travelling between points, just keep burning her and wait for her to use Displacement. She'll either come up where she went down, or leap forward a little. Just keep your LMB on her and she'll go down. HK-206 has never really caused me any problems. He deals high damage, but you can mitigate it and your mobility if you trigger Devotion > Divine Wind means you can easily strafe around him whilst using LMB. Just be sure to use Smite to cause burning on him before you consume the Orbs. Imani, as always, is super easy to kill if she's caught out of position. Keep her tracked down with your LMB and hit her with Smite burning ASAP. If she stealths, just stick around until she pops out. If you've already caused burning on her, she'll be easy to track down. Knossos is pretty awful for Vadasi. His combination of immobilize, knockdown and damage can eat you very quickly. You'll spend 90% of your time running and I'd honestly recommend you do just that. If you can dodge his Gore you're in a better position but you need to cast Devotion early, burning him quickly then Divine Wind for health. Keep LMB on him and use your speed from Divine Wind to escape. Mozu is a weird one because she can deal huge damage, but I've never actually struggled to kill her. There's no mistaking if you ignore her and let her rip into you, you're going to take huge damage. However, 3 or 4 Smite attacks and she's going to die. Better still, using LMB on her will force her to Dimension Door early. Just heal up when she escapes. The Margrave is incredibly frustrating to fight against because he has so many interrupts and means of slowing you. The best thing you can do is try to escape as quickly as possible, but it's particularly difficult. Try to duke him as much as possible, cause him to waste Hellburst and wait for his Charge/Leap. If he uses either, quickly use Devotion > Divine Wind to leap away/heal. When at range again, keep using Smite. It's the best you can hope for. Tripp is a challenge but also fairly easy to deal with when you use your skills correctly. All you have to remember is that Tripp will always open from stealth, and if you try to escape, will use Electric Slide. The key is to mitigating the opening burst and reducing the chances of being hit by further skills. When she opens on you and depending on the damage you've taken, gain some distance, use Devotion and hit her as quickly as possible with Smite. Keep doing so as long as possible, consume your Orbs and then strafe around her using LMB. If you've your Focus, use it at this point. If not, just be conscious of your Devotion cooldown and when necessary, begin to back off just as it comes off cooldown. Boot it up again, and use RMB again. As long as you duke her melee attacks, she'll die. Tyto The Swift is similar to Tripp in the fact he's very predictable. He'll throw Fang first, Swoop towards you and use Blade Dance. Use Smite against him (with Orbs) as early as possible, consume them and leap away in time to avoid his Blade Dance. Once he's used this, he's so vulnerable. Following up with LMB/Smite rotations is more than enough to finish him off. If he's particularly aggressive, he'll double Leap you and try to just use LMB. Use your speed and jump height to kite him. Sven can be a nuisance for Vadasi because of his armor break, burning and self heal. It's a fight that can go on for a while and in all honesty, I'd avoid the battle unless Sven is already low health. Vadasi versus Vadasi is mostly a case of who uses Devine Wind first if it isn't you and you're a good aim, she'll die before you do. If you miss some Smite attacks early, you'll likely be forced to heal and then you're in trouble. When it becomes a LMB versus LMB, it only boils down to who has the most health. Voden is annoying more than a challenge for Vadasi. His poison reduces your healing by 50% meaning he can quickly neuter your ability to survive. Having said that, at range you can easily nuke him down with burning Smite and there's little he can do. If he gets a little too close, you risk him using his Focus at which point you'll be forced to use Devotion > Divine Wind. If you are poisoned, try to time it so that you heal when its ended for maximum impact. Also if possible, try to kill his clone with the burning splash from Smite. Wu is much more difficult for Vadasi to deal with than Tripp or Tyto because if you try to escape, he can Tongue Lash you back. What I'd recommend is that you cast Devotion early to cause burning to him (in proximity and through Smite) and wait out his Tongue Last. Once he uses it, use Divine Wind to knock him back, gain speed and jump away. Keep him pinned down with Smite and if he comes at you, just have your LMB ready. When Devotion is ready again, use it only when Divine Wind is off cooldown. Kiting Wu is key. Xenobia has never caused me much trouble as Vadasi because your rate of fire with Smite combined with its burning keep her under a lot of pressure. Although she has life stealing from her LMB, her AOE Mark of Despair is easy to dodge and you can continue to fire Smite at her continually. The key is to avoid her immobilize but even then you can comfortably use Devotion > Divine Wind. This section of our guide contains a list of tips and tricks we think will help your Vadasi play. We'll continue to add to the list as required and if you have any tips you'd like to share, let us know in the comments below and we'll place them here. 1. Always, always, always remember that Devotion reduces your health. Never use it when you're already low and being directly attacked as you'll end up crippling yourself or dying when you shouldn't have. 2. Devotion when used boosts your attack or healing. Make use of it to spike heal allies (LMB) or deal burning with Smite. 3. Rember that when upgraded, you gain super speed and a super jump from Divine Wind. It's incredible for escaping. Make use of it! 4. You should always try to keep your teams health topped up with LMB as it'll allow them to get back into a fight quicker. 5. You're able to use LMB on creatures to reduce their "build time" or to heal them when they've taken damage. 6. Your highest spike rotation when next to an enemy is Devotion > Smite (x4) > LMB (to consume your orbs) - just be sure to have enough health left that you don't leave yourself too vulnerable. 7. Armor of Faith is the only skill in the game that provides total immunity. Make use of it to destroy people 1 on 1 or to gaurentee your escape. 8. If you find you're dying too much with this build (it is high level and a rather aggresive playstyle) swap Devotion Talents and take Purifying Ritual/Divine Renewal. You'll get a cleanse and shorter cooldown on Devotion for much more healing.